It uses a card of Standard Hands, against which all games are played; these cards are changed annually. It uses more tiles, notably the Joker. The game is started with "Charleston", or the passing of 3 unwanted tiles from one player to another. It uses Jokers to complete quints and sextets in several combinations of hands. 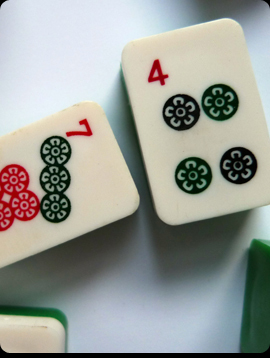 Mah Jongg is enjoying a resurgence in popularity, with millions of dedicated players around the world and a variety of Internet and computer versions. A very small amount of time and effort is required to become familiar with the elementary principles of the game.Your patience in mastering the fine points of Mah Jongg will be repaid many times by the keen enjoyment invariably derived from the game. For information on how to use the League's services, visit the Services Page. To order merchandise, visit our on-line Store.